THAT’S A GOOD QUESTION! 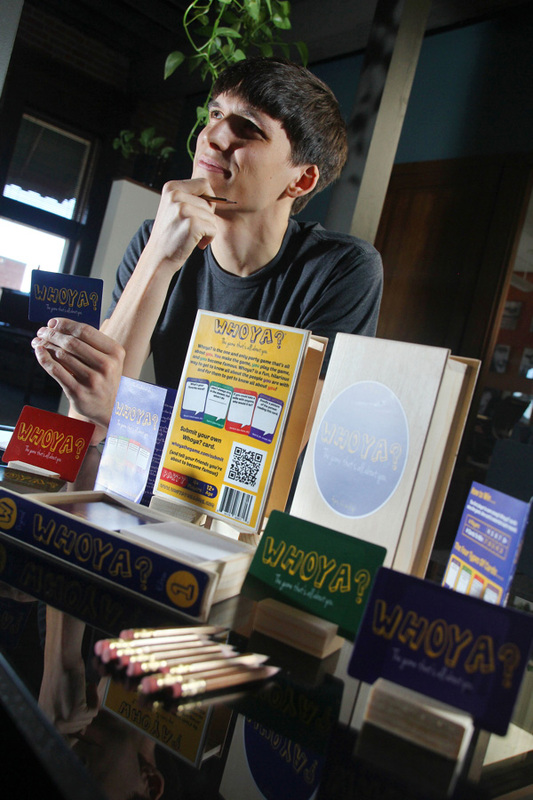 Eau Claire native Justin Hertz created the relationship-building game Whoya? If you don’t know Justin Hertz, you probably should. The Eau Claire native is a sweet guy, which is evident in his “Kindrally” group on Facebook, his encouraging words to those connected with him, and his music (which you can check out at justinhertz.bandcamp.com). He genuinely cares about people and getting to know them better. Aside from being a kind and generous soul, he apparently also likes to have fun, which is why he created Whoya?, an interactive relationship-building game that hit the market in November. Whoya? is all about having fun getting to know the folks you play it with. The basic gist of the game is that, for each round, there is one judge who picks a card. The card will have a question or challenge to which the other players will then write a response. Those questions/challenges will range from “What’s your favorite word?” to “If you were a giant for a year, what would you do?” to “Doodle a picture of the person reading this card.” Imagine the fun possibilities! These questions will stimulate self-revealing creativity in the players. The judge then will try to figure out which player gave which response. While there will certainly be lots of laughs when Whoya? is played, the consistent undercurrent will be the players getting to know each better and becoming more deeply connected, which is a part of Hertz’s modus operandi. This is not just a party game. It’s a game intended to be fun and to build community at the same time. This dual purpose is part of the game’s appeal, and it is also means Whoya? will be a game for multiple contexts and various groups of people. It can be as innocent, sophomoric, or “adult” as the players want it to be. It is appropriate for a church youth group or for folks sitting at a bar. This flexibility is one of the main strengths of the game. No matter the context or the company, Whoya? works. It can be as innocent, sophomoric, or “adult” as the players want it to be. It is appropriate for a church youth group or for folks sitting at a bar. This flexibility is one of the main strengths of the game. No matter the context or the company, Whoya? works. One of the other interesting aspects of the game is how it developed. While Hertz is the mind behind Whoya?, he is not the sole creator of the game. In fact, the questions and challenges were created by “you.” One of the taglines for the game, according to Hertz, is “Whoya? is the one and only party game that’s all about you. You make the game, you play the game, and you become famous.” How did “you” make this game and perhaps become famous? All the questions/challenges were crowd-sourced. As Hertz was developing the game, he asked for people to suggest questions or challenges to be used in Whoya? So, quite literally, many people (38 main contributors) played a role in the development of the game. After months of development and accumulating questions and challenges, the time has come for Whoya? to be unleashed on the world. You can buy the game online at www.whoyathegame.com, or in the Chippewa Valley at Games by James, The District Company, and The Local Store, 205 N. Dewey St.